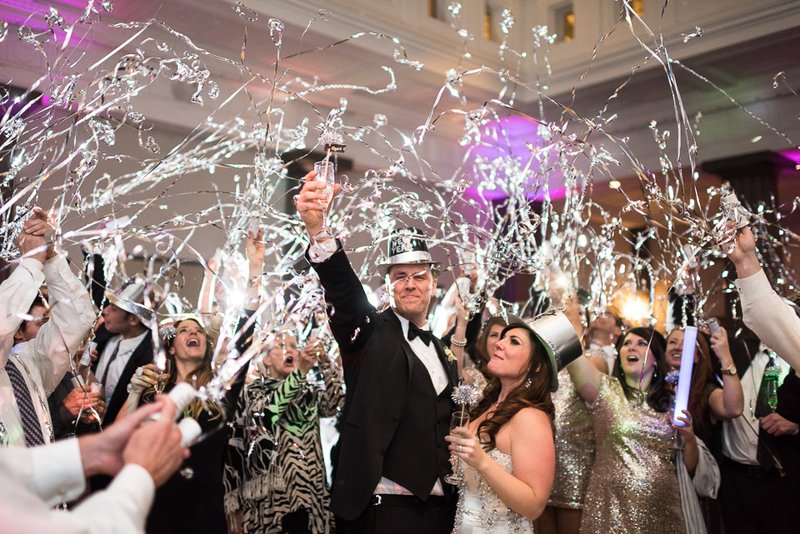 Mandi and Brendon’s downtown Denver New Year’s Eve wedding was everything I hoped it would be and more! By the time their wedding came around I had been talking with them for over a year, so I had plenty of time to get excited for what sounded like an amazing wedding. It did not disappoint! The weather didn’t completely cooperate and temperatures peaked in the mid-20s, but that didn’t slow down this crowd. Everyone gladly braved the cold to witness the wedding and party for one last time in 2014. And party they did! The dancing kept everyone warm throughout the evening and at the stroke of midnight the dance floor was filled with flying streamers, cheering guests and kissing couples. Throughout the day, and even during the entire time I’ve known them, I kept forgetting that Mandi and Brendon weren’t already married. Their relationship and interaction with each other seems so comfortable, so certain. I see many years of happiness in their future and many more celebrations at the stroke of midnight on future New Year’s Eves. Congratulations Mandi and Brendon! Laura and Sam Are Engaged!